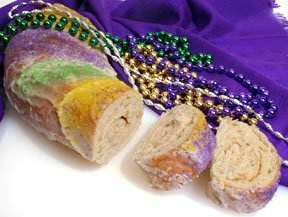 No Mardi Gras celebration would be complete without the festive King Cake, a sweet cinnamon flavored dessert. Baked in the shape of a circle to represent the unity of Christianity, the bread is decorated with icing and colored sugars denoting the three Kings who visited the baby Jesus on the 12th day after Christmas, the day of Epiphany. A small figure of the baby Jesus is placed inside the bread and the person receiving the piece of bread containing the figure is the one responsible for making the King Cake the following year. Learn step-by-step how to remove the vein from shrimp to prepare it for your favorite Mardi Gras recipe. See how to fix boiled rice so it is nice and fluffy for your gumbo, jambalaya and other Creole-style recipes.